We are excited to announce that BC Robotics is now an official distributor for Hover Labs! Hover Labs have created a couple very cool products: Beam and Hover. We now have these two unique products in stock – so what are they and what do they do? 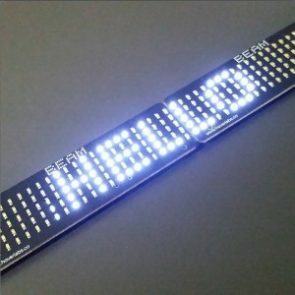 Beam is an easy to use LED matrix featuring 120 White LEDs – perfect for displaying scrolling text, animation, or even creating custom lighting effects. Beam uses I2C to communicate, meaning it is compatible with just about any microcontroller or single board computer out there. These are even chainable to create longer displays. To find out more check out the Beam product page! Hover is quite unique; this sensor can detect multiple gestures, taps, and even pinpoint your hand in 3D space. Positional data and gestures are transferred by way of I2C to the connected microcontroller or single board computer. To learn more about this sensor check out the Hover product page!